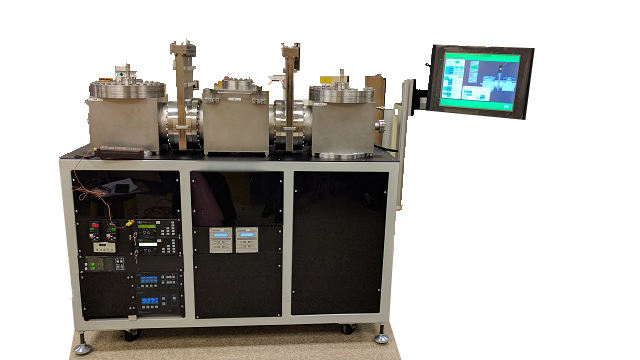 Two Plasma Enhanced Chemical Vapor Deposition chambers with a shared Airlock needed a control system to integrate the various instruments, and provide a convient method to control and store data. An Automation Direct Productivity PLC and CMore HMI was called upon to meet the customers requirements at the most economical point. Click this heading for more info! Arapahoe Controls provided the Engineering and Design of a Fanuc robotic workcell. The six axis robot was fed by a set of conveyors coming off of four CNC milling machines. The workcell integrated Fanuc's new Dual Check Safety (DCS) fencing and light curtains. Arapahoe Controls provided the control system for a set of conveyors that route loaves of bread from a cooling unit to three automatic slicer and bagger machines. Speed Stacks required a quick integration of a controller with a fixture they designed and built in-house. It consisted of a GE Fanuc VersaMax Nano PLC with an expanded output module. Input was a simple pushbutton and output was to a bank of 8 indicator lights and 6 pneumatic cylinders. It interfaced with a Banner PresencePlus vision system. There is a series of 20 test steps the PLC paces the vision system thru. Each step either continues, or stops execution and lights the appropriate indicator lamp with the test results. The program number is sent from the PLC to the vision system via. a pulse train specific to each test file in the camera. The vision system acquires and analyzes each image and sends back a pass/fail. The timer is advanced thru it's functions by small cylinders pressing the buttons on it's keypad. Each function is verified by the vision system looking at the LCD display and LED indicators on the product. This is a two sided workcell, both are nearly identical. The product is a matrix of components of various numbers of rows & columns. A pair of MicroLogix PLC's are interfaced with PanelView OIT's and Yamaha RX222 dual axis motion controllers. The principle of operation is for the PLC to act as the master controller, directing a Yamaha dual axis robotic slide, and a digital testing unit to test the product row by row. The PLC will track faulty parts, and when the testing is complete, direct the robot to the locations with faulted parts and removing them by a vacuum pickup. There are also several diagnostic capabilities that have been programmed into the PLC. The vacuum system is verified by removing product in a pre-defined "X" pattern. A re-test option is available to verify that faulty parts have been removed. Several runtime alarms have been programmed in to alert the operators of batch problems, identified by both row and column. Variables are accessed in the OIT to specify the tolerance of failures in each row or column, to identify a faulty batch. Arapahoe Controls successfully integrated a Cognex InSight 5400 vision sensor with an Allen Bradley ControlLogix PLC. Vision Tools were selected to differentiate the proper part out of an array of 60. The solution ended up utilizing the CLX messaging instruction to send the part number data to the InSight. 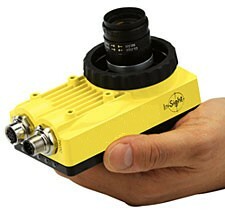 The original plan was to use OPC, but, the Cognex OPC compatability was only to other Cognex hardware. Hopefully, they'll open this up soon. The customer completed their motion end of things, and had a successful runoff. We provided the electrical engineering and PLC programming for an ergonomic improvement project to unload unwieldly rolls of material from a beam. The hardware was an Automation Direct DL06 PLC and SureServo drives. There were three axis' of motion and 80+ digital I/O. A complex series of tasks was requested of us in providing the electrical design and programming for a 6 station dial table indexing machine. Three individual components are loaded in bulk to the workcell, and the controls process them into a finished, inspected product. An Automation Direct DL205 PLC with a fully loaded local and remote rack was used for control. Two Animatics servo motors were also implemented along with a Camco indexer. Display is by a 10 inch color C-more touchscreen. The Leanin' Tree greeting card company in Boulder Colorado selected Arapahoe Controls to design, build, and program the control system for their plant expansion. 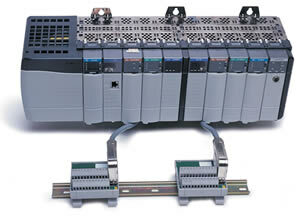 Hardware used was an Automation Direct DL06 PLC to control the contactors for 28 conveyors. There are several merge points for boxed products, and lift gates all requiring control system intervention to prevent collisions.